I have very frightening, very sobering, and yet very reassuring news; and we need to know these facts and we need to be awake to them and heed them and not be asleep to them. 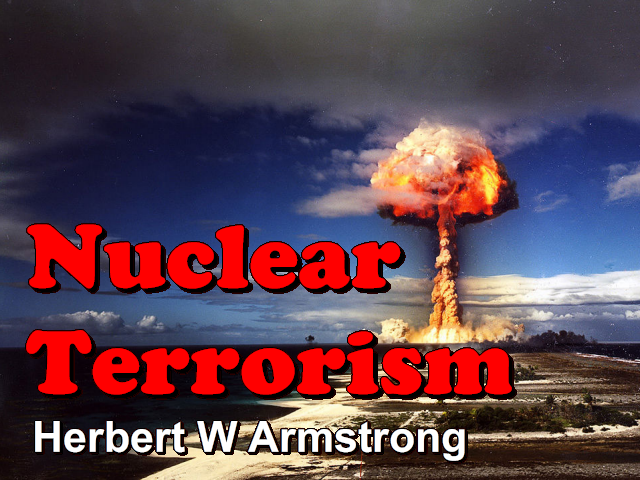 You need to know the facts on nuclear terrorism and how it is escalating today. It threatens the life of every one of us including you and me. Now what does the Bible prophecy say is going to happen? The only barometer, the only thing that will tell you what really does lie in the future — what is actually going to happen — is Bible prophecy. I want to give you the actual facts and they're more frightening by far than people realize. Then I want to give you what Bible prophecy says about it and that also is more frightening and yet it is also more reassuring than people realize and the world's only hope. The world entered the Atomic Age only thirty-seven years ago — just in our time — only thirty-seven years ago. Eight seconds past 8:15 am on August the sixth, 1945, an atomic bomb burst over Hiroshima, Japan. Suddenly seventy-five thousand lives were snuffed out almost instantaneously. And three days later the same thing happened to another of Japan's great industrial cities — Nagasaki. The world for the first time had witnessed a real terrorism of the power of the tiny atom, and of the terrific almost inconceivable unbelievable power in the atom. Seven years later- and that's only twenty-nine and one half years ago now — the hydrogen bomb was announced — one thousand times more destructive than the atom bomb; the atom bomb is only a trigger to set off a hydrogen bomb. A hydrogen bomb — one hydrogen bomb — would destroy New York City; it would destroy London; it would destroy Paris, Tokyo, San Francisco, Los Angeles — would wipe out whole vast areas. Well, soon the Soviet Union had everything we have and they have gone on until the day they have actually passed the United States in the power of nuclear weapons. But then, it was not long after the Soviet also had atomic weapons until Britain, France and China joined the nuclear club and they had the hydrogen bomb. Now probably one half dozen other countries, and that will include every county virtually in Europe, has nuclear power. They either have now or will have it in the next two or three years. Small countries even now have nuclear weapons. Thirty-five other countries can have now or will have in within a very few years. Now among those countries are: Argentina — and we've been having a fear of war with, or, between Argentina and Britain as I have recorded this program. Brazil, Israel, Iran, Libya, Egypt, — other nations have or will have very, very soon — nuclear weapons. My friends, stop and think about this: What if a real mad man — head of a nation — should set off; and it might only be a minor nation — set off an atomic weapon? It would start a chain reaction that would go from nation to nation and every last man, woman and child on the face of the earth could be blasted out of existence. That is what we face now and that could never have happened until within our lifetime -just the last few years. Never before has such a frightful thing faced every one of us and all mankind on the face of this earth. Now what about such leaders as Kaddafi, as Khomeini, as, well, another Hitler that might arise or as Arafat, or men like that. You think that men like that would hesitate to use an atomic weapon? It can and could happen here! And we've been slumbering on thinking that no one is going to dare use such a frightful power. Well now, what does Bible prophecy say? Let's look into that, the facts are more terrifying than you realize but let's look at the prophecies in the Bible. I want to go back for a moment now to Matthew 24 which is the greatest prophecy of Jesus Christ. It's recorded in Matthew 24 and the same saying of Christ is also recorded in Mark 13 and Luke 21; but let's just use Matthew 24 at this time. I've gone into it time and again but I want to bring certain facts out to you that I haven't stressed in this same way before and in this connection of the very thing that we face today. Now actually His Second Coming and the end of this world — or this age, this time, this society — was not going to happen in their lifetime. Jesus Christ knew that but they didn't, they thought it was going to happen almost immediately; they thought it would happen about the same time and so they asked those questions. Now Jesus answered their first question first because that only happened in their lifetime. That's what people have been doing and that's what they been doing ever since; they said the law of God is done away, Jesus nailed it to the cross. Jesus Himself said: "...I have kept my Father's commandments" (John 15:10). He said: "...think not that I have come to destroy the law" (Matthew 5:17). He did not. You know I was absolutely shocked and amazed fifty-five years ago, to see that everything I'd been taught in Sunday school as I was a boy growing up, in a most respected protestant Sunday school, was just the opposite of what the Bible says. If you blow the dust off of your Bible, if you'd look and see what the Word of God says, and it is the Word of God, this is God speaking in the Bible, and it is just the exact diametric opposite of what so many believe is the gospel. We've been hearing a gospel of men about Christ; but the gospel of Christ is the gospel that Jesus Christ Himself preached. Now I would like to have you notice what gospel He preached at this point. And if you'll notice in Mark the first chapter and the first verse in Mark's gospel: "The beginning [now if you notice in Mark, chapter one and verse one] The beginning of the Gospel of Jesus Christ" (Mark 1:1). The kingdom of God is a government; it's a — the kingdom of God is the family of God; the born Family of God administering the government of God over the whole world and over all nations. People don't know that today because that gospel has not been preached. That is change your own life, change your ways, repent of the way you're living; the way we're living is causing all of the trouble. The way humans are living is what is causing all of the frightful situation that we're in just now. Men have been inventing many things; we are living in a time of absolutely awesome accomplishment, amazing accomplishment and of advancement in many respects, but all in material respects. And yet we're living in the time of the most appalling troubles and evils that have ever beset humanity and mankind. How do you — how do you square that? How do you square the thing with any kind of truth? Except the very fact, that the way we're living is producing material things but we don't know how to live with one another or with our God. And the way we're living is bringing us to destruction and it's time that we wake up. They were not the apostles of Christ, they said they were; they came in His name saying that Jesus is the Christ but they were false apostles. Fifty-five years ago, I was challenged; I had to prove to myself does God even exist? I'd always supposed He did, I'd been brought up from childhood to believe in God. Now I went into a study of evolution, and I went to an in-depth study; and I studied Darwin and Huxley and Haeckel and Spencer and all of those fellows. But I proved that that was wrong; and I proved that God is real, and that God does exist and that God is Creator. And then I looked into the Bible and I studied it intensively, and in-depth and I put it to every test; and I proved to myself. It doesn't make any difference whether I prove it to you or not; you can prove it to yourself if it means anything to you — or do you care about your life and about your existence and about your eternity? I proved that this Word is God speaking. The Bible is God speaking. It isn't going to really happen. In other words, it is a time after the gospel of the kingdom is proclaimed that there would be the weapons of mass destruction that could destroy everyone and no flesh would be saved alive. That has never happened before the hydrogen bomb my friends. And the world has not heard the gospel of the kingdom until this time; and you're hearing it now. Those things go together. Now what is going to happen after that? As the King of kings and Lord of lords to rule all nations on this earth, and that means the United States; that means Britain; that means France and Germany; that means Russia and that means Japan; and that means every nation on the face of this earth. That cannot be some different time than the one that Jesus spoke of in Matthew 24; there can only be one time that is greater than anything that ever happened; more terrifying, more destructive than anytime that ever had happened; and, or ever will. "...even to that same time: and at that time shall thy [God's] people be delivered, every one that shall be found written in the book [the book of Life]. And many of them that sleep in the dust of the earth shall awake..." (Daniel 12:1-2), in a resurrection. So, you see immediately after the tribulation is going to come the Second Coming of Christ. Now the preaching of the gospel of the kingdom precedes all of that, and it's just before the Great Tribulation and then immediately is going to come the Second Coming of Christ. My friends, that could never have happened until the hydrogen bomb came — just thirty years ago — twenty-nine and a half years ago. It never could have happened, and it couldn't happen until this time. So, it is more terrifying than you understand, or than you realize; but there is more hope also because God's people are going to be delivered and then is going to come the Second Coming of Christ and He's going to cut short those days and all flesh is not going to be destroyed. But man would destroy himself except that God Almighty is going to intervene and send Jesus Christ as King of kings and Lord of lords in great power and splendor. What is Jesus like in His glorified body? You find it described in the first chapter of the Book of Revelation: "...his eyes are like flames of fire [and His face is not a pale face like yours and mine; or a yellow or a black face or whatever color]: it shines like the very sun in full strength so it would even blind your eyes looking at it." (Revelation 1:14 and 16 paraphrased). And that is the Christ that is coming. And Satan is going to be removed, the power that is working in this world and causing this world to live in a way that is causing all of these troubles — all of these troubles. That is the message that must go to the world and to all nations — not into every nation but as a witness for all nations. And it is going, and it is going by my voice to this whole world. My friends, I want you to write in — or telephone in immediately — for some very important literature. 'Are We In The Last Days?' Is this the generation when that is going to happen? I've just given you absolute evidence of it. But here is a booklet I have: 'Are We In The Last Days?.' I haven't announced this booklet before on this program. I would like to have you... some of our researchers have compiled this; it's profusely illustrated and it's in full color and I'd like to have you get it — there's no charge for anything that we have — we don't charge for anything, we don't ask for contributions, none of that; we want to give not get, that is our policy. 'Are We In The Last Days?' I would like to have you write in; this will give you evidence that we are living in the last days. And so, until next time this is Herbert W Armstrong, goodbye friends.